圖2. (A) TEM image of cryo-fixed sectioned and stained extracellular Mimivirus particles revealing a star-shaped structure at a unique vertex. (B) Cryo-TEM image of a whole vitrified fiber-less Mimivirus. (C) SEM image of the star-shaped structure in a mature extracellular Mimivirus particle. (D) Cryo-SEM of an immature, fiber-less particle. (E) Tomographic slice of a mature intracellular Mimivirus particle captured at a late (12 h post infection) infection stage. As shown in Video S1, at this late stage the host cell is packed with mature viral particles. 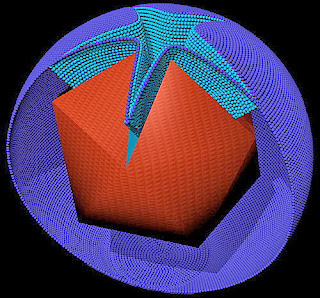 (F and G) Volume reconstruction of the particle shown in (E), revealing the presence of an outer (red) and inner (orange) capsid shells. The star-shaped structure is present in both shells but adopts partially open (dark, star-like region), and completely sealed configurations in the outer and inner shells, respectively. (H) Superposition of the two shells in (F) and (G). (A) TEM projection of a phagosome-enclosed particle sectioned along a plane that contains the whole star-shaped structure. 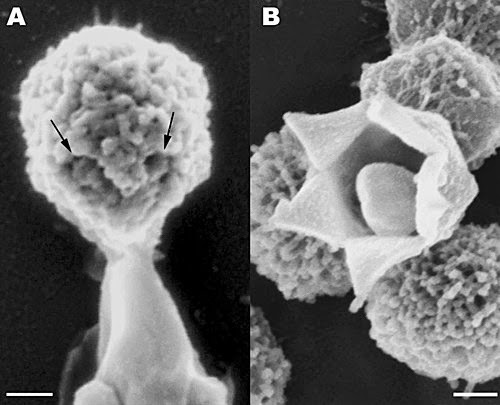 The observed features are similar to those characterizing extracellular Mimivirus particles (Figure 1A) and mature intracellular particles (Figure 1E), thus indicating that the starshape assembly is present in the capsid throughout the life cycle of the Mimivirus. The inset provides the various possibilities for random sectioning of the Mimivirus particle. (B) TEM projection of a phagosome-enclosed particle sectioned along a plane that does not contain the star-shaped assembly, thus revealing only unmodified vertices. (C) TEM projection of a phagosome-enclosed Mimivirus particle, revealing the star-shape structure (blue arrowhead) sliced in its center along the plane depicted by a blue line in the inset in (A). analyses of thick sections, as demonstrated in Figure 7 and in Video S3. Scale bars: 500 nm in (A), 200 nm in (B), 100 nm in (C). 圖6. Electron Tomography of a DNA Packaging Site. (A) Tomographic slice of a procapsid undergoing DNA packaging. The DNA-loaded packaging gateway and the stargate are highlighted (green and red arrowheads, respectively). Scale bar, 100 nm. (B) Volume reconstruction of the particle depicted in (A) showing the orifice through which DNA (green) is packaged, which spans the outer and inner capsid shells, and the internal membrane (red, orange, and blue, respectively). The protein core underlying the membrane is shown in gray (See Video S3 for the whole tomogram). 圖7. Stargate Opening. (A) SEM image depicting the release of membranal structures following exposure of mature, extracellular Mimivirus particles to 83 8C for 30 min. Membrane release consistently occurs at the stargate (arrows pointing to the fiber-less edges of the stargate). 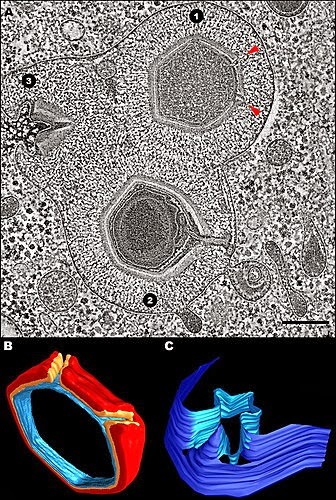 (B) Extracellular Mimivirus particle revealing a conspicuous 5-fold opening. Such open stargates were detected in a small population of extracellular particles, and may represent empty viral particles released upon the viral-induced lysis of the host cells. Scale bars, 100nm. doi:10.1371/journal.pbio. 圖8. Mimivirus Uncoating and Membrane Fusion. 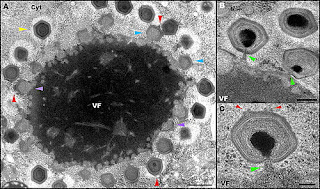 (A) Tomographic slice of a late phagosome enclosing three Mimivirus particles at early, advanced, and final uncoating stages (particles 1, 2, and 3, respectively). At the early uncoating stage, a partial opening of the inner protein shell at the stargate assembly is initiated. The red arrowheads highlight the star-shaped structure sectioned along the plane depicted by a red line in the inset in Figure 2A. The opening of the stargate allows for the extrusion of the viral membrane towards the phagosome membrane, a stage characterizing particle 2. In the final uncoating stage, fusion between viral and phagosome membranes occurs, as revealed in particle 3. The lysosomes surrounding the phagosome should be noted. The reconstructed volume of the tomographic slice is shown in Video S2. Scale bar, 100nm. (B) Volume reconstruction of particle 1 in (A), showing the outer (red) and inner (orange) capsid shells and the closely apposed inner membrane (light blue). 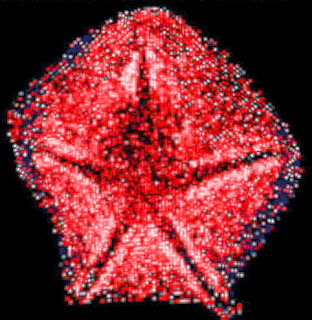 The opening of the star-shaped structure in the inner shell (in contrast to its closed configuration in extracellular particles or in particles enclosed in early phagosomes) should be noted. (C) Surface rendering of particle 3 in (A), showing fusion of the viral and phagosome membranes (light and dark blue, respectively) at the site of the opened star-shaped structure. The boundary between the viral and phagosome membranes is arbitrary. 圖9. Schematic Representation of a Mimivirus Particle at Its Final Uncoating Stage. The capsid (red) is opened at the stargate, allowing for fusion of the viral and phagosome membranes (light and dark blue, respectively), thus forming a star-shaped membrane conduit (See Video S2 for the tomogram from which the model was derived). and 500 nm in (C). 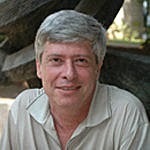 Zauberman N, Mutsafi Y, Halevy DB, Shimoni E, Klein E, et al. Distinct DNA Exit and Packaging Portals in the Virus Acanthamoeba polyphaga mimivirus. Adapted from materials provided by Weizmann Institute of Science.